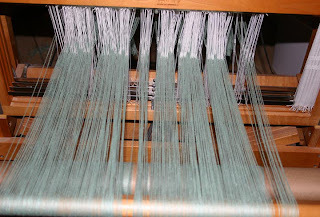 Yesterday I finally decided on a weaving project using a threading from Marguerite Davison's Handweaver's Pattern Book. 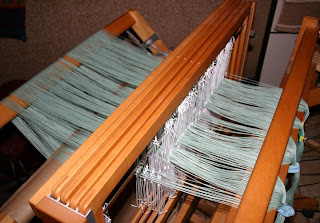 I wound the warp chain and threaded the reed last night. I could have started on the heddles, I had time, but something made me wait. And I'm glad I did. After reading Kimberly's blog today, I've changed my plan, yet again. Using Kimberly's idea, along with instructions I found here and here, I sat down with graph paper and planned a name graph. The number of threads I cut and threaded last night turned out to be the exact number I needed for this newest incarnation. How freaky is that? This project was meant to be. So what does it say? Not going to tell until it's done.